In a split verdict, relating to payment of compensation under the Land Acquisition Act, 1894 for the solatium should be from the date of acquisition or from date of pronouncement of the constitution bench judgment in Sunder , a bench of Justices V. GopalaGowda & Adarsh Kumar Goel referred the matter to a 3 judge bench. However, no terms of reference were pronounced. A two Judge Bench of the Supreme Court of India on Tuesday set aside the Madras High Court Judgment which quashed multiple Criminal Proceedings against former DMK RajyaSabha MP Vasanthi Stanley. Bringing into focus the plight of disabled people, the Supreme Court on Monday fumed at several states not filing responses as to steps taken to implement various provisions of the Disability Act. 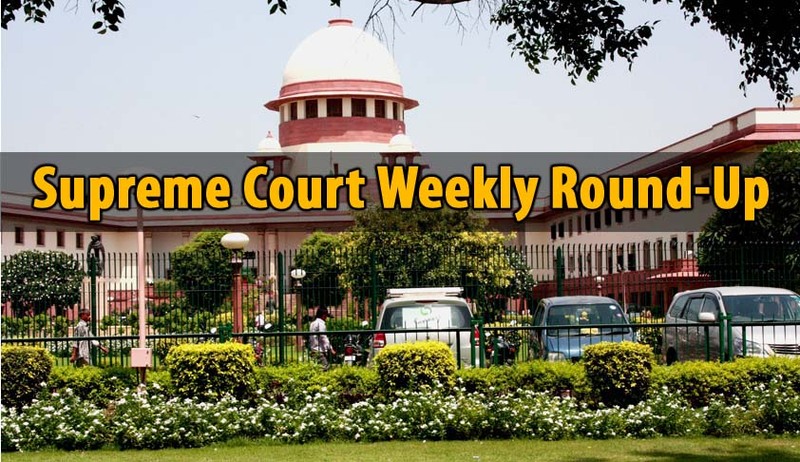 Supreme Court on Monday issued notice to the Centre, state and Registrar General of all High Courts on a petition which sought setting up a separate pay commission for the approximate 18,000 subordinate court judges in the country. The Supreme Court stayed a criminal case pending against India’s ODI captain, MS Dhoni, in a Karnataka Court, The allegation was that his photo portraying as Lord Vishnu holding several things, including a shoe in his hands was published in a business magazine. Allegations that his relatives held disproportionate assets came back to haunt former Chief Justice of India K G Balakrishnan, four months after he retired as NHRC chief and a full five years after he superannuated as Chief Justice of India. The Supreme Court on Wednesday began hearing the pleas of dismissed Gujarat Cadre IPS officerSanjiv Bhatt seeking SIT probe into allegation of misuse of state machinery during 2002 post-Godhra riots and the alleged roles of top BJP and RSS functionaries and some senior bureaucrats. The two dalit girls allegedly ordered to be raped by a ‘Khap’panchayat of Bhagpat in Western UP after their brother eloped with a higher caste Jat girl got a massive relief from the Supreme Court on Wednesday. The Supreme Court on Thursday refused to interfere with an order staying the ban announced by the Maharashtra government on sale of meat in Mumbai holding that the Bombay High Court gave extensive reasoning while staying the ban order. Dismissed Gujarat Cadre IPS officer Sanjiv Bhatt on Thursday averred in the Supreme Court that he would not get a fair trial in Gujarat if the State Police investigates the complaint against him as the justice delivery system in the State has collapsed. He alleged victimization for consistently maintaining and deposing before the SIT, the court amicus and the Nanavati Commission that the Modi government was complicit in the riots.